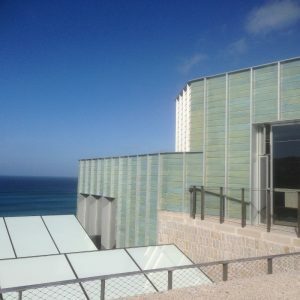 The Tate in St Ives has been closed for 18 months while they dug into the rock face to create an enormous new gallery space. (link here to the Guardian for more info) I had an invitation to the opening but thought I couldn’t go as we would be on holiday in Portugal…. BUT lovely Ryanair and the French air traffic control conspired against us and our holiday was delayed by a week. In a cloud of disappointment and feeling very unsettled, we decided to take off to St Ives as we could now attend the grand opening. As it was it turned out to be fortuitous occurrence as the weather was like summer and the event was incredible. The new space is bigger than anyone expected with polished concrete floors and voluminous space inside. There is now a permanent exhibition of St Ives artists and history. A free evening of canapes and tours was very exciting. We even got to sit next to Jon Snow from Channel 4 news in the beach cafe overlooking Porthmeor beach the next day. A very exciting time for Cornwall. I only took a few snaps and have just loaded the one above. I love it because the ceramic tiles on the back look like verdigris copper but are in fact all hand painted and they were incredibly beautiful. You will have to go and see for yourself. We eventually got to Portugal and had a fabulous holiday. A win win all round.